Dominic Podbury and his team at Banksia Lounges. 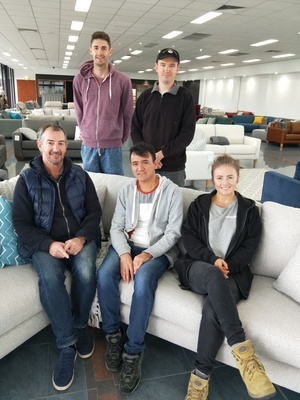 Retailer and manufacturer Banksia Lounges offers new sofas, custom orders and reupholstering from their new showroom and studio in Sharon Crt, North Geelong. With more than 40 quality-made sofas on display, including leather and a vast range of fabrics to choose from, this innovative business offers a world of possibilities from floor stock items, bespoke custom made options and refurbishment and makeovers. “Banksia is Geelong’s largest re-upholsterer,” business owner Dominic Podbury says. Banksia offers a quick turn around with most orders completed in four weeks, which according to Dominic, is considerably less than the usual eight-week wait for delivery from larger companies and importers. Dominic is thrilled to be able to offer local apprenticeships and continue the tradition of local, quality furniture which is built to last. For more information, phone 5229 2167 or visit banksialounges.com.au.